Photos from recent events within the Village of Islandia. On December 1, Village of Islandia residents came out to celebrate the holidays at the village’s thirteenth annual Christmas tree lighting ceremony. “Joe the Singing Bus Driver” performed under the big tent as he played guitar and sang holiday songs, while residents danced and enjoyed hot cocoa, coffee and cookies. After the tree was lit, Santa Claus came down to give out toys to the good little boys and girls of Islandia. The children also received candy canes, courtesy of Mrs. Claus. On November 30, the Village of Islandia held a Good Neighbor Gala on the grounds of Village Hall to recognize three of its residents—Patricia Ann Kellner, Maria Depaula-Walsh and Robert Sutton—for their positive impact on the community. On November 10, the Village of Islandia held its annual Veterans Day ceremony at the Veterans Memorial Triangle. Mayor Allan M. Dorman, who served in the U.S. Marine Corps during the Vietnam War, was joined by local elected officials, war veterans and representatives from the Lakeland and Central Islip Fire Departments to honor those who served and continue to serve in the armed forces. On September 11, the Village of Islandia held a special ceremony at the new First Responders Memorial in honor of the memory of five local first responders who were killed during the September 11, 2001 attacks: Raymond M. Meisenheimer, Peter Brennan, John P. Napolitano. Glen K. Pettit and William J. Mahoney, Jr. Despite the heat and humidity outside, more than 800 Islandia Village residents still managed to come out to the thirteenth Annual Bar-B-Que on July 14. Children in attendance received a free baseball-themed gift pack containing a box of Cracker Jacks and an inflatable baseball; the theme was to commemorate the recent grand opening of First Responders Memorial Ball Field. The Village of Islandia opened the First Responders Recreational Ball Field just in time for the summer. The day began with the unveiling of the memorial dedicated to local first responders who lost their lives on September 11, 2001. Following the memorial, there was a ceremonial first pitch. On May 26, Mayor Allan M. Dorman, Village of Islandia, joined local war veterans and elected officials in its annual Memorial Day ceremony, in which those in attendance remembered all who died while in service to this country. 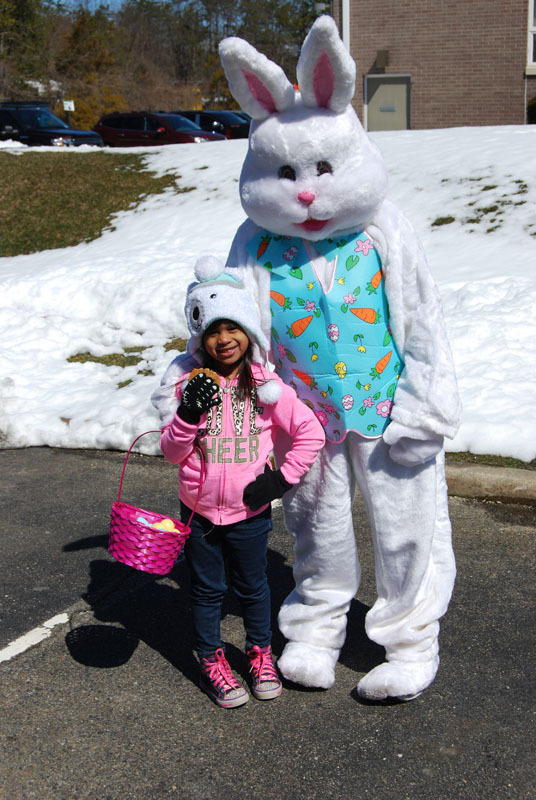 Neither the cold temperatures nor the aftereffects of the Nor’easter kept away local children and their families from the Village of Islandia’s 13th Annual Easter Egg Hunt, which took place on the grounds of Village Hall on March 24. Children had the opportunity to color their own Easter eggs, get their picture taken with the Easter bunny and guess the number of jellybeans in the jar. Each child also received a basket full of Easter eggs which contained pieces of candy; some of them also had tickets which they could redeem for a special prize. Those in attendance were treated to cookies and hot cocoa and entertained by the music of "Joe the Singing Bus Driver." Six hundred residents came down to Islandia Village Hall to celebrate Halloween at The Village of Islandia’s 12th annual Pumpkin Fest on October 28. Throughout the event, children decorated their pumpkins, took part in a Halloween costume parade and contest and joined their families on hayrides. Islandia’s own “Joe the Singing Bus Driver” was there to tell spooky stories and sing Halloween songs to the children. The village also provided guests with hot cocoa, cider and cookies. All the residents left with their very own pumpkins. Seven hundred seventy-two Islandia Village residents came out to the twelfth Annual Bar-B-Que, which was held on July 15. This year’s theme was “The Wild Wild West” as children in attendance received a free T-shirt to commemorate the event and a cowboy hat. More than 50 volunteers — comprised of Village volunteers and local Boy Scouts — helped out at the event. Some of them served residents hamburgers, hot dogs, corn, salad, ice cream, soda and water, while others operating the carnival games at the event gave the children a chance to win some prizes. Children enjoyed the day with a water slide, hayrides, games, races, pony rides, a petting zoo, face painting, piñatas, train rides, a limbo contest and a dunk tank. Musicians and a local DJ provided the music to keep the party going. In addition, Mayor Dorman hosted a blueberry pie eating contest with the winners each getting a blueberry pie. The Bar-B-Que also featured raffles, in which two lucky children each won a bicycle, courtesy of Bolla Market. On July 9, approximately 700 Islandia Village residents came out to the eleventh Annual BBQ. This year’s theme was “The Wild Wild West” as children in attendance received a free T-shirt to commemorate the event and a cowboy hat. Village employees and local Boy Scouts served residents hamburgers, hot dogs, corn, ice cream, soda and water. Children enjoyed the day with hayrides, games, pony rides, a petting zoo, arts and crafts, face painting, piñatas, train rides, a limbo contest and a dunk tank. A local DJ provided the music to keep the party going. In addition, Mayor Allan M. Dorman hosted a blueberry pie eating contest with the winners each getting a blueberry pie. The BBQ also featured raffles, in which two lucky children each won a boys’ and girls’ bicycle and one Islandia resident went home with a 48-inch flatscreen TV. On May 28, the Village of Islandia held its Memorial Day ceremony at the Veteran’s Memorial Triangle, located at the intersection of Old Nichols Road and Johnson Avenue. Local elected officials, war veterans and village officials were in attendance. Islandia Village Mayor Allan M. Dorman, a Vietnam veteran, recognized those who served our country — including local war veterans who have since passed away — and acknowledged the local veterans groups who have attended the current and previous ceremonies. There was also a laying of the wreaths at the memorial. View video. On July 11, more than 500 Islandia Village residents came out to celebrate the village’s 30th anniversary during Islandia’s 10th Annual BBQ. This year's theme was “Star Wars,” as costumed characters from the film greeted visitors and the Village Hall parking lot was decorated with R2-D2 balloons. On May 23, the Village of Islandia commemorated Memorial Day in a special way this year as Mayor Allan M. Dorman announced the grand opening of the Col. Francis S. Midura Veterans of Foreign Wars Post #12144 during the village's annual Memorial Day ceremony. Islandia residents braved the cold pouring rain to turn out for the 9th annual Christmas tree lighting ceremony on December 6 at Village Hall. “Joe the Singing Bus Driver” performed under the big tent as he played guitar and sang holiday songs. Residents stayed dry and warm as they enjoyed hot cocoa, cookies and cupcakes while listening to the music. On November 8, the Village of Islandia held its annual Veterans Day ceremony at the Village Memorial Triangle. Mayor Allan M. Dorman, a Vietnam veteran, was joined by local elected officials, war veterans and representatives from the Central Islip Fire Department to honor those who served and continue to serve in the armed forces. On July 12, more than 500 Islandia Village residents came out to the 9th Annual BBQ. Village employees and local Boy Scouts served residents hamburgers, hot dogs, ice cream, soda and water. It is said that one man's junk is another man's treasure. On June 7, Village of Islandia residents cleaned out their garages, attics, basements and closets and brought their unwanted items to the "Ye Olde Fashioned Tag Sale" on the grounds of Village Hall. On April 12, more than 500 children and adults came out for the Village of Islandia's 9th annual Easter Egg Hunt. Village residents enjoyed cookies, juice, coffee and tea while having the chance to meet the “Easter Bunny” and listening to live music performed by Islandia's own “Singing School Bus Driver,” Joe Guida. Islandia residents turned out for the 7th annual Christmas tree lighting ceremony on December 1 at Village Hall. Children went on hayrides, visited the Christmas cottage and had the opportunity to meet Frosty the Snowman. It is said that one man's junk is another man’s treasure. On August 10, Village of Islandia residents cleaned out their garages, attics, basements and closets and brought their unwanted items to the "Ye Olde Fashioned Tag Sale" on the grounds of Village Hall. 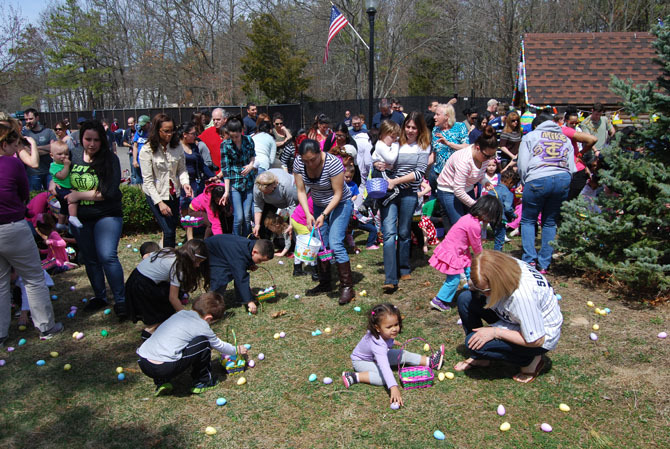 On March 23, three hundred fifty children and adults came out for the Village of Islandia’s 8th annual Easter Egg Hunt. During the event, Mayor Allan M. Dorman made a special presentation honoring Shy Main Shieh for offering her time and talents at all of the village’s events. The Village of Islandia held its annual Veterans Day ceremony at the Village Memorial Triangle. Mayor Allan M. Dorman, a Vietnam veteran, was joined by local elected officials, war veterans and representatives from the Central Islip, Hauppauge and Lakeland Fire Departments to honor those who served and continue to serve in the armed forces. The Village of Islandia held its 8th Annual Pumpkin Fest on October 20 on the grounds of Islandia Village Hall. On October 6, Village of Islandia residents cleaned out their garages, attics, basements and closets and brought their unwanted items to the "Ye Olde Fashioned Tag Sale" on the grounds of Village Hall. On August 11, Village of Islandia residents cleaned out their garages, attics, basements and closets and brought their unwanted items to the "Ye Olde Fashioned Tag Sale" on the grounds of Village Hall. On July 14, more than 800 Islandia Village residents came out to the 7th Annual BBQ. Village employees and local Boy Scouts served residents hamburgers, hot dogs, ice cream, soda and water. The Village of Islandia held a Memorial Day ceremony at the Veteran’s Memorial Triangle, located at the intersection of Old Nichols Road and Johnson Avenue. The Village of Islandia held its seventh annual Community Garden Planting on the village hall grounds. Children scampered the village hall grounds searching for Easter eggs during the 7th Annual Easter Egg Hunt on March 31. Islandia residents turned out for the 6th annual Christmas tree lighting ceremony on December 3. Children went on hayrides, visited the Christmas cottage and had the opportunity to meet Frosty the Snowman. The Village of Islandia honored its war veterans at a special Veterans Day ceremony on November 5. Mayor Allan M. Dorman, a Vietnam War veteran, joined the village board in thanking those who served and those currently enlisted in the armed forces for their service. The Village of Islandia held its 7th Annual Pumpkin Fest on October 22 on the grounds of Islandia Village Hall. It is said that one man’s junk is another man’s treasure. On August 13, the Village of Islandia asked its residents to clean out their garages, attics, basements and closets. On July 9, Islandia Village residents came out to the 6th Annual BBQ. Village employees and local Boy Scouts served residents hamburgers, hot dogs, ice cream, soda and water. On May 7, the Village of Islandia held its sixth annual Community Garden Planting on the village hall grounds. Children scampered the village hall grounds searching for Easter eggs during the 6th Annual Easter Egg Hunt on April 16. Islandia residents turned out for the 5th annual Christmas tree lighting ceremony on December 4. Residents stayed warm under the big tent and enjoyed cookies and hot cocoa as “Joe the Singing Bus Driver” played guitar and sang holiday songs. The Village of Islandia honored its war veterans at a special Veterans Day ceremony on November 6. Mayor Allan M. Dorman, a Vietnam War veteran, joined the village board in thanking those who served and those currently enlisted in the armed forces for their service. Five hundred local children came dressed in their favorite costumes, decorated pumpkins, took part in a costume parade and helped themselves to cookies and hot cocoa. Prizes were awarded for best decorated pumpkin and best costume. It is said that one man’s junk is another man’s treasure. On August 14, the Village of Islandia asked its residents to clean out their garages, attics, basements and closets. Bad weather didn’t dampen the residents’ spirits as the Village of Islandia hosted its 5th annual Bar-B-Que on July 10. This year’s barbecue had a 1950s theme, with music from the time period, vintage cars on display and an Elvis impersonator. The Village of Islandia celebrated its 25th anniversary as village residents were served breakfast by village employees and members of Boy Scout Troop #272 of Ronkonkoma. Children scampered the village hall grounds searching for Easter eggs during the 5th Annual Easter Egg Hunt on March 27. They also got a chance to meet the Easter Bunny and some of their favorite cartoon characters in person. The village of Islandia has announced its winners of the Coloring Contest that took place at the village’s annual Easter Egg Hunt. Five winners were named. The weather outside was frightful, but that did not scare away Islandia Village residents who came to the 4th annual Christmas tree lighting. The Village of Islandia honored its war veterans at a special veterans memorial dedication ceremony on November 7. The Village of Islandia held its 5th Annual Craft Fair and Pumpkin Fest on October 24 on the grounds of Islandia Village Hall. Local children came dressed in their favorite costumes, decorated pumpkins, took part in a costume parade and helped themselves to cookies and hot cocoa. The Village of Islandia hosted its Summer Bar-B-Que. More than 800 village residents turned out for this fun-filled event. Children scampered the village hall grounds searching for Easter eggs. They also got a chance to meet the Easter Bunny and some of their favorite cartoon characters in person. The village of Islandia has announced its winners of the Coloring Contest that took place at the village’s fourth annual Easter Egg Hunt on April 4. Fifteen winners were named, as the five village board members each chose their three favorites. Islandia Village held its third annual tree lighting ceremony today at Village Hall. Children visited the mini-Village Hall, and received candy canes from Mrs. Claus. Islandia Mayor Allan M. Dorman unveiled the new war veterans memorial that was built at the Veterans Memorial Triangle. Children took part in the Pumpkin Fest, where they joined in fun activities such as pumpkin painting, a visit through the Haunted Tunnel and a costume parade. See the winners of the Village of Islandia Pumpkin Fest Coloring Contest which took place during the Craft Fair and Pumpkin Fest. We served hamburgers and hot dogs with all the works. Small pools were set up for the little ones while two misters helped to cool off the adults. Children hunted eggs on the Village Hall Lawn, enjoyed cocoa and cupcakes, participated in a coloring contest, and met the Easter Bunny. See the winners of the Village of Islandia Easter Egg Hunt Coloring Contest which took place during the 3rd Annual Easter Egg Hunt. Islandia residents celebrated the start of the holiday season with the 2nd Annual Tree Lighting at Village Hall. Boys, girls and Islandia residents of all ages celebrated Halloween at the annual Craft Fair and Pumpkin Fest. Hundreds of residents and their children enjoyed a day of fun and games, food and goodies at the annual Bar-B-Que. More than 130 children attended and were greeted by the Easter Bunny and Dora the Explorer. Residents gathered with friends and family to share in the fun with a few tricks and treats. Village residents gathered at Village Hall for a Craft Fair. Hundreds of village residents and their families attended the 1st Annual Country Bar-B-Cue at Village Hall. Village residents joined Village officials for the dedication of the Community Victory Garden of Islandia.